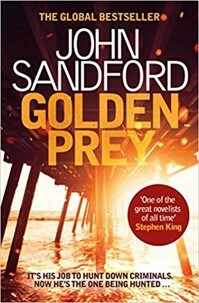 John Sandford is one of the best thriller writers on the planet and GOLDEN PREY is a perfect example of why he’s achieved such success. It’s the twenty-eighth book in the Lucas Davenport series and it takes him from the Minnesota Bureau of Criminal Apprehension to the U.S. Marshals Service, thereby giving him more status and control over the cases with which he deals. A counting house belonging to a drug cartel is robbed and suitcases of money disappear. In the course of the crime, five people are killed, including a girl of six. Davenport goes after the villains but he has competition from the cartel itself as its boss is determined to get his money back. Luis Soto and Charlene Kort are dispatched to find and destroy the thieves. Soto’s rap sheet is horrendous and Kort is a kindred spirit, who, having killed and dismembered one victim, takes a delight in cutting people up without benefit of anesthetic. The hectic chase has all kinds of surprising twists and turns. Davenport has the resources of modern technology to call on yet is often beaten to the punch by people, working for the cartel, with illegal access to the same information. The new marshal has to get to the killers first while protecting his back from Soto and Kort, the stop-at-nothing psychopaths. The pace of the novel is beautifully controlled throughout. There are endless action scenes, punctuated by the rough and ready humour that is Sandford’s speciality. It’s not a book for the squeamish. The scene where Kort gets to work on someone with her “home-improvement tools” is particularly grisly but totally believable. Davenport has had a long and exciting run. This may well be his best case yet.